Sculpting came naturally to Cathryn Jenkins, who grew up in the small mountainous town of Revelstoke. In an artistic household, Cathryn remembers her mother, Fran Jenkins, carving small chunks of soapstone in the kitchen. The stone came from the local mountains, prospected and quarried by her mother. Jenkins could not leave the stone and tools alone, and began her career as a sculptor in her early years. As an athletic young person, Cathryn had worked for Glacier National Park, B.C. in the summers, and this added to her firsthand experience with the grizzly bears, and their environment. “My parents loved and collected art, and so did I,” states Cathryn. It was this passion which lead to owning her own gallery between 2000 and 2004 in White Rock B. C. It was there that Cathryn held exhibitions for artists including Jack Shadbolt, Robert Davidson, Norval Morrisseau, and others (artists in attendance). She sold the gallery, in 2004, to focus on her sculpture. Major influences in her artistic life are Fran Jenkins, Rosetta, and Sandy Scott. Cathryn’s interest in the American Women Artist group (Rosetta, and Sandy Scott and others) in the early 2000s, brought her to apply to their continental competitions After making her way to be a Signature member, she was invited to be an AWA Master (the most elite category), in 2012. Cathryn has always loved her time in her studio. All her artistic life her mother continued to sculpt and prospect. This put Cathryn in the unusual position of having a great selection of the most beautiful local carving stone. Cathryn focused on larger works, and developed extensive studios in her back yard in Langley, B. C., where she could work seriously, and still be a stay home mom to her two children. Cathryn continued her love of other sculpture throughout decades of work. She has also exhibited in Arizona, New Mexico, Georgia, and Texas, through the AWA, and continued to sell well, which allowed her to take on and complete large projects. Cathryn continues to grow and explore sculpture. In the last few years she has worked with engineers and fabricators to develop large bird mosaics, in order to achieve height and drama in sculpture that is suitable for foyers, in corporate locations, and large homes. She became more interested in bronze casting, working in clay, and other media, and also attended a fantastic workshop with Patrick Kipper in Loveland Colorado, in 2014, to learn and be inspired by great patina and its process. 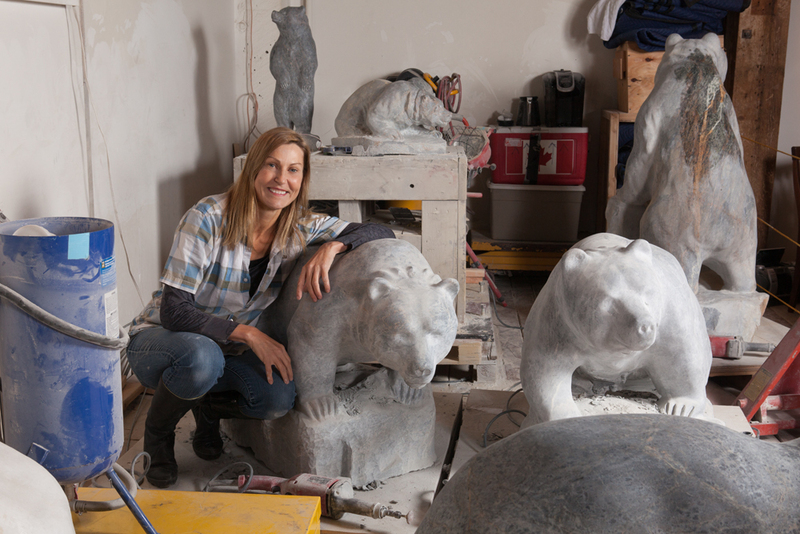 With significant success in larger bronze works, such as the running bronze Grizzly ”On the Move”, Cathryn continues to combine a sense of freedom, and power, and agility in her sculpture. She has also made the decision to keep her limited edition size small. Cathryn has a body of consistent work that is available through the galleries that represent her, and her own studio. Always looking to move forward with some new ideas, Cathryn possesses several large blocks of black, hard stone that will make wonderful dramatic works that will show line and form due to the monochromatic dark nature, and its dense, tough, and durable qualities. The plan is to have two or three started by the spring of 2016. 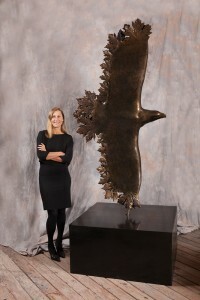 Her most recent work in bronze, an Eagle in flight, is inspired by the simple and enduring beauty of nature. Walking into Cathryn’s studio at 1000 Parker Street, Vancouver, the viewer is greeted by an eagle in full flight, eight feet in height, gracefully banking with its wing tips appearing to be fluttering in the wind. 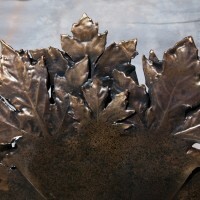 It is only upon walking up to the bird that it becomes apparent that the bronze feathers are actually cast maple leaves. The edges of the leaves forming the wing tips, while the simple elegant, slim form of the bird contrasts with the somewhat jostled fluttering ”feathers”. The idea was inspired by the relationship of elements in nature. “I was simply inspired by the fluttering leaves on a local maple tree, and how the wind can bring movement to any still landscape. I was creating eagles in flight at the time…and the elements of movement and flight seemed like such a beautiful combination,” she said. Cathryn also enjoys the open armed feel of this Canadian Eagle that graces the main area of the studio. “I do love the iconic symbol, that Canadian Maple Leaf, for the warm memories it gives me. As a child growing up in the 1960s, I believed that I lived in the most wonderful country in the world.” Although Cathryn states she is not a nationalistic person, she believes that most of humanity does want to feel “glorious and free”.